For any Indian festival, the must have dessert is Payasam/ Kheer. If any feast is planned, payasam definitely has its place. With the festive season around, I decided to post some dessert recipes for this week. 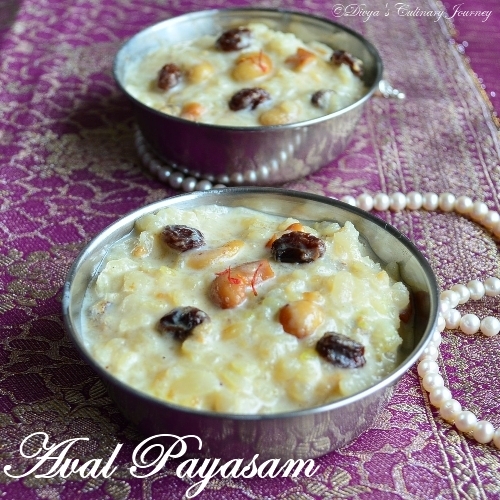 Todays recipe is Aval Payasam. 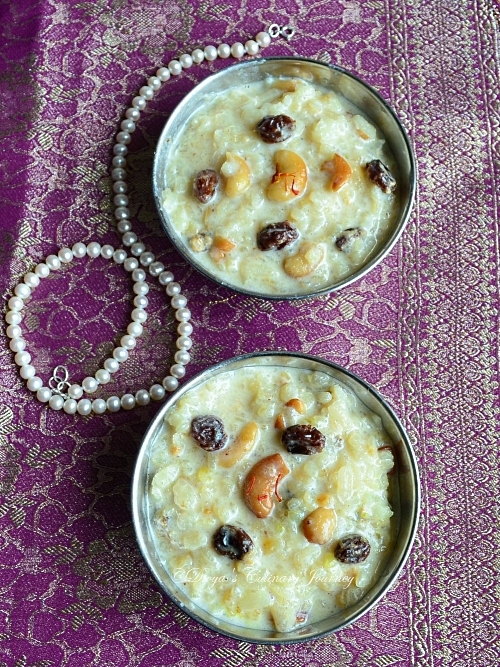 It is a rich, creamy pudding made with flattened rice/ Beaten rice, sweetened with Sugar and loaded with raisins and cashews. 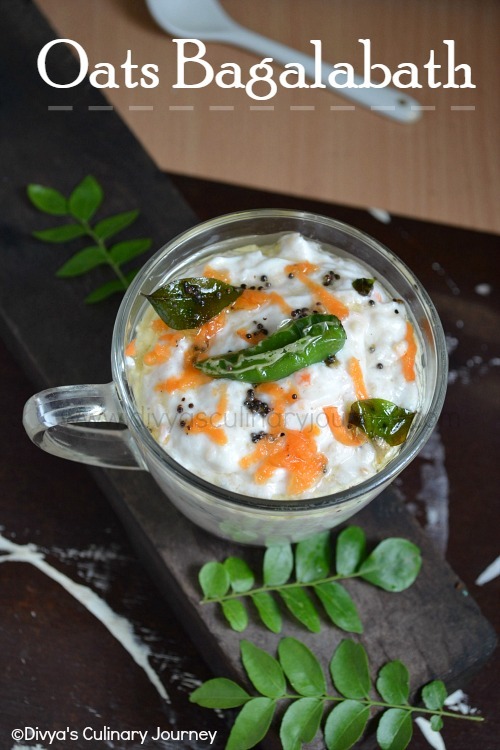 Very easy to make and a very comforting payasam. Powder cardamom with 2 Tablespoons of Sugar and keep it ready. Fry cashew and raisin in a tablespoon of ghee and set aside. Heat a tablespoon of ghee, add aval and fry it for a minute or two till it lightly changes color. Now add 2 cups of milk and simmer at low flame till the aval cooks. Then mix the rest of the sugar and another 2 cups of milk and simmer for 5-7 minutes. Now add the powdered cardamom,a pinch of saffron, fried cashews and raisins mix well and turn off the heat. Serve it warm or serve chilled as desired. You can increase or decrease the cashews and raisins as per your preference. For a variation, you can add other dry fruits and nuts too. Payasam thickens with time, so dilute with little milk before serving. I added 3/4 cup of Sugar, If you like to be more sweeter then add 1/4 cup. Adjust the sugar as per your personal taste. Just yummy!! I love this Payasam! iam yet to try this. looks yum! simple and delicious. We gujjus make this on sharad poornima. so i am making that day too. Never get bored of this delicious kheer, looks very rich and super creamy. 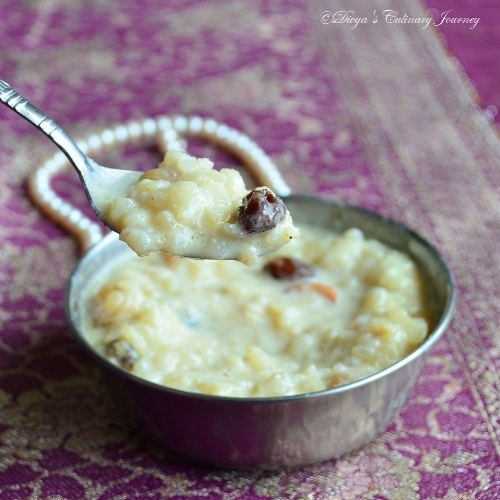 Love this payasam so much,creamy and rich. first time here and loving your space. such beautiful recipes. the kheer looks scrumptious. perfcet for the festive season. OMG...i made the exact same payasam yest, but with coconut milk. :-) Super! Aval payasam looks delicious and perfect. This is the quick desert that I can try anytime. Rice payassam takes a while to cook. I wish I could put that spoon right into my mouth :D Great! This looks delicious. I love kheer with cardamom.